This 102 square kilometer national marine park, dubbed as “The Golden Bowl of the Gulf of Thailand”, is 25 kms west of Samui. It has been enlisted as the second national marine park since 1980. The park is composed of 42 islands such s Koh Pa Luay, Koh wua Taa Lub, Koh Mae Koh, Koh Hin Dub, Koh Nai Put and Koh Tai Plao. 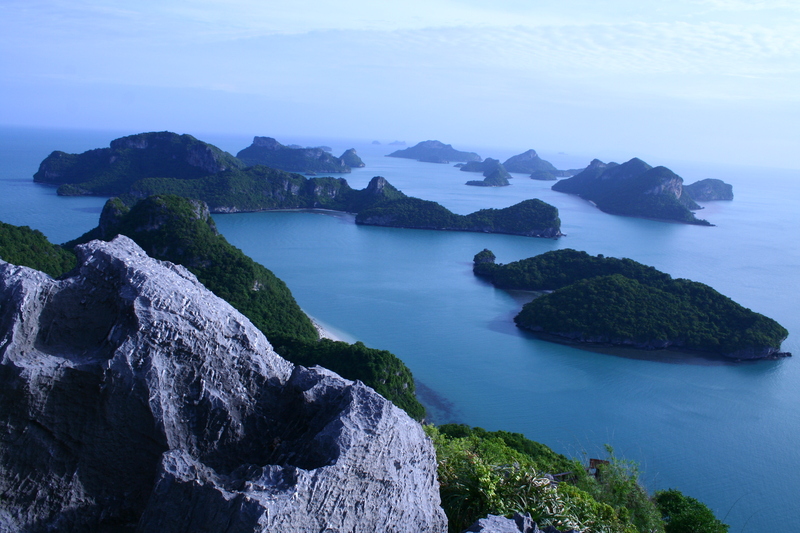 Most of the islands’ terrains are limestone cliffs except Koh Pa Luay. The highest cliff situated in shallow sea near the coast is about 369 meters from mid-sea level. Due to sediments from theTaa Pee River, the sea is not quite clear. Near the southwestern coast, lies narrow coral reefs. There are many caves, openings in the rocks, and long tunnels along the rain shadow areas which are influenced by the northeastern wind. The long tunnels are nesting places of swallows. The rare plant which can be found only at Koh Wua Taa Lub and Saam Sao is white orchid. Small plants such as Dracaena loureiri, Euphorbia lacei, and Morinda elliptica normally grow on limestone mountains. Terminalia catappa. Hibiscustiliaceus, Calophyllum inophyllum, Pandanustecloriusceae, Hibicus tiliacens, and Crinum asiaticum are found on the beaches and hills near the sea. Mangrove forest, which Rhizophora apiculataa grows, is rare. Since the terrain is full of limestone mountains, only small animals such as Chelonia mydas, Eretmochelys imbricate, pythons, Indian pied hornbills, little green herons, brahminy kites, and Macaca fascicularis can live. Southern Presbytis phayreis, the rare wild animals are found only at Koh Wua Taa Lub. The coral reef includes Metridium marginatum, brain-like coral, and branch coral which is rare. In the very deep sea which the sunshine cannot pierce through there is no coral; only coral line, Capparidaceas, and Tridanca squamosas are found. The park is a breeding ground of several sea fishes such as Monodactylus argenteus, par-rot fish, Toeniura lymna, Chiloscyllium indicum, and Cromileptes altivelis. The sea along the Angthong Strait is the area where Rasstrelliger kanagurta, Clupeoides lile, and cuttlefish lay their eggs. The large emerald natural pond with 250 meters width and 350 meters length is surrounded by limestone-mountains. The tunnel under the water is linked to the open sea. It is believed that the contraction of the limestone might cause the top of the tunnel to sink. Talay Nai is the destination of tourists since there are several impressive viewpoints. That is the highest viewpoint, one can see the perfect view of both Talay Nai and the open sea.